Land Rover has announced its first plug-in hybrid Range Rover model, which has CO2 emissions of as low as 64g/km. The Range Rover Sport P400e PHEV costs from £70,800 and is available to order for delivery in early 2018. The P400e uses a 300PS 2.0-litre petrol engine in conjunction with an 85kW electric motor, for a total output of 404PS and peak torque of 640Nm. Acceleration from 0-62mph takes 6.7 seconds, yet official economy is 101mpg – though that figure barely means anything in a PHEV. Under normal conditions the car acts like a traditional hybrid, using a mixture of electric power and the petrol engine to provide the best compromise between performance and economy. The driver can also engage a pure EV mode in which, with full charge, the P400e can cover up to 31 miles without using any petrol. The battery has a capacity of 13.1kWh and can be charged fully in two hours 45 minutes using a 32amp charger, or seven hours 30 minutes using the supplied 10amp, three-pin home charging cable. Range Rover has introduced the new engine alongside other changes to the Range Rover Sport for 2018. There is an updated infotainment system with two 10-inch touchscreens, redesigned LED headlights and a new gesture-controlled sunblind, which can be opened with by waving a hand in the right way rather than with a switch. Other changes include a power hike for the top SVR model – up by 25PS to 575PS. The naming structure for engines has been tweaked too – with a letter denoting the fuel type and number indicating power – so for example the P300 is a 300PS petrol. An e suffix denotes a plug-in hybrid. Initially these changes only apply to the P300 and P400e engines, but will apply to others in due course. 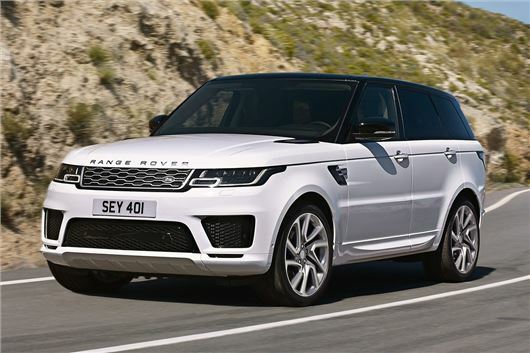 Prices for the updated Range Rover Sport start at £61,315 for the SD4 in HSE trim and rise to £99,680 for the SVR. The P400e hybrid costs from £70,800 in HSE, £73,800 in HSE Dynamic and £84,400 in Autobiography Dynamic. Key question, does the hybrid RRS retain the seven seats option?